Prime Minister Ahmet Davutoğlu called on Turkey's political parties to come together and agree on a new constitution during his balcony speech to celebrate the Justice and Development (AK) Party's regained parliamentary majority in the November 1 snap elections on Sunday. "I'm calling on all parties entering parliament to form a new civilian national constitution," he said in a balcony speech to thousands of AK Party supporters at the party headquarters in Ankara, as fireworks lit the sky. "Let's work together towards a Turkey where conflict, tension and polarisation are non-existent and everyone salutes each other in peace," he said, once again highlighting the importance of peace and solidarity. With AK Party's significant lead in the polls with 49.35% and 316 parliamentary seats, Davutoğlu underlined that today there were "no losers but winners", and this victory belongs to the people of Turkey. The PM further added: "I am addressing you today not as the head of AK Party, but the prime minister of 78 million Turkish citizens." Davutoğlu also assured the people of Turkey that their democratic rights were under the protection of AK Party, while giving his word that this message received from Turkish citizens today, would be reflected in the AK Party government's works and efforts for the next four years. Branding the polls a "victory for [our] democracy and our people", Davutoğlu said "We are coming to rebuild a new Turkey along with each and every citizen." 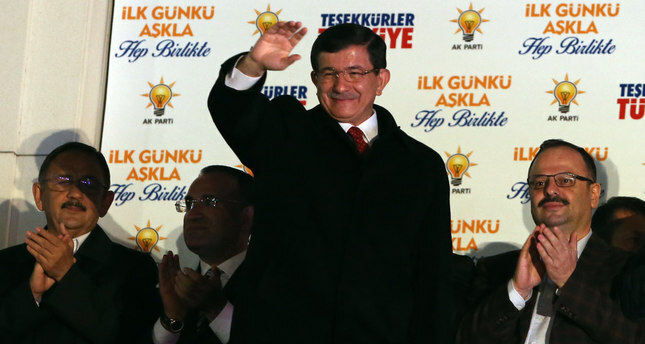 The AK Party clinched victory after securing nearly 50 percent of votes in Turkey's 26th general election Sunday. Electoral committees across the country's 81 provinces, divided into 85 voting districts (Istanbul, Ankara and Izmir provinces have multiple districts), started the vote count after polls closed at 5 p.m. local time. The preliminary voter turnout across Turkey is 87.26 percent. More than 54 million Turks were eligible to vote in a poll to elect 550 deputies to the Grand National Assembly. In general, the People's Democratic Party (HDP) and the MHP suffered losses, while main opposition CHP's votes mostly remained unchanged. The AK Party currently leads with 49.35 percent of the votes (316 parliamentary seats), followed by the CHP with 25.45 percent (134 seats). The MHP gained 11.97 percent (41 seats), while the HDP secured only 10.61 percent (59 seats), which is just above the election threshold requirement of 10 percent.